It's Migraine Awareness Week this week (2nd-8th September 2018), and The Migraine Trust are shining the spotlight on this common debilitating condition. Book an appointment today at Liz Manning Acupuncture - 15% off all treatments until 1st November 2018! Like most conditions, migraines affect everyone differently. Whilst the symptoms vary from person to person, the most common manifestation is an intensely painful headache with sensory disturbance - blurred vision, sensitivity to light, sound and smells and nausea. Migraines affect an estimated 6 million people in the UK  and are estimated to cost the NHS £150 million per year in GP visits and prescription drugs . Research has found that acupuncture has a significant advantage over pain medication in decreasing the frequency and intensity of migraines . Studies have also found that patients tolerate acupuncture better than medication due to fewer reported side effects. 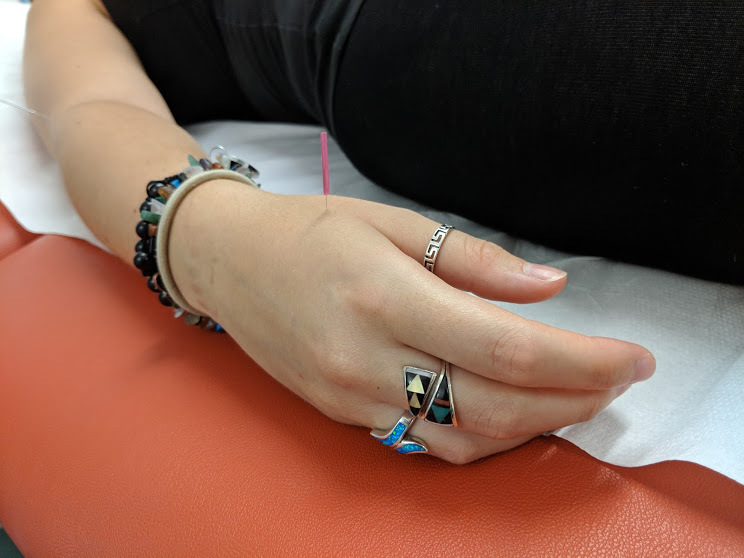 When treating migraine patients, I usually use a combination of acupuncture to move qi, cupping to relax the patient and release stagnation and heat, and finish off with a little tui na. My patients have reported instant relief from migraines during and after treatment, and longer lasting results after their second treatment. We are currently offering an introductory 15% off all treatments! Book your appointment today or get in touch to find out how acupuncture can help you! If you suffer from migraines, please visit your GP for further investigation. For more information, please visit the Migraine Trust.
. National Institute for Clinical Excellence (2011). Botulinum toxin type A for the prophylaxis of headaches in adults with chronic migraine.
. The All-Party Parliamentary Group on Primary Headache Disorders (2010). Headache Disorders - not respected, not resourced.
. Xu, J., Zhang, F., Pei, J. and Ji, J. (2018). Acupuncture for migraine without aura: a systematic review and meta-analysis. Journal of Integrative Medicine, 16(5), pp.312-321. Da Silva, A. (2015). Acupuncture for Migraine Prevention. Headache: The Journal of Head and Face Pain, [online] 55(3), pp.470-473. Available at: https://www.ncbi.nlm.nih.gov/pubmed/25683754 [Accessed 6 Sep. 2018]. Acupuncture.org.uk. (2018). Migraine and Acupuncture: The evidence for effectiveness. [online] Available at: https://www.acupuncture.org.uk/a-to-z-of-conditions/public-review-papers/migraine-and-acupuncture-the-evidence-for-effectiveness.html [Accessed 6 Sep. 2018]. BMJ Best Practice. (2018). Migraine Headache in Adults. [online] Available at: https://bestpractice.bmj.com/topics/en-gb/10 [Accessed 6 Sep. 2018]. Cochrane. (2018). Acupuncture for preventing migraine attacks. [online] Available at: https://www.cochrane.org/CD001218/SYMPT_acupuncture-preventing-migraine-attacks [Accessed 6 Sep. 2018].